Nani-Nagarjuna’s multi-starrer has become the first film to be shot in the Hyderabad metro. 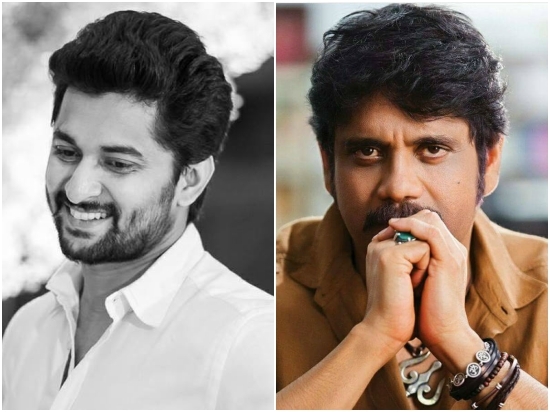 Veteran actor Nagarjuna and the versatile performer Nani will soon be seen together in a multi starrer that has already created a buzz amongst fans. The film went on the floors on Ugadi and the first schedule has been wrapped up. During the schedule, scenes featuring Nani and Rashmika Mandanna were shot in a Hyderabad metro train at the Miyapur Metro Station. As such, this has become the first film to be filmed in the Hyderabad metro. Well, that is indeed a nice achievement and we hope that the film turns out to be memorable one. Interestingly, this is a busy time for Nani as well as Nags. Last month, Nani tasted success as a producer when AWE opened to a good response at the box office and received praise for its unconventional presentation. Described as a ‘genre bender’, it featured Kajal Aggarwal and Nithya Menen in the lead and proved to e a game changer for T-town. While speaking about his decision to turn producer, he had said that it was his way of giving back to the industry. At present, he has KAY in his kitty. As far as Nagarjuna is concerned, he was last seen in Raju Gari Gadhi 2 and delivered a solid act. Also featuring Samantha in the lead, it did well at the box office and received praise . At present, he has Officer in his kitty. It is his first film with RGV in a while and features him in the role of a cop. While announcing it, RGV had said that it is pretty different from anything he has done in the past. So, are you excited about Nani’s film with Nags? Comments, please!